Thank you for joining us for the Butterfly Beauty Challenge and we hope you will all join us again this week too. Simply include a metallic element somewhere on your project! This is Beulah‘s last week with us in the Designer Spotlight and we would like to say a huge thank you for all of your fabulous creations over the past month, It has been a pleasure having you along with us! Beulah made an assemblage that celebrates creativity. An Idea-ology Quote Band inspired me to assemble a variety of metal objects including a Gadget Gear, Faucet Knob, and Number Brad along with a vintage key and some rusty bits found on the street. A Burlap Panel worked well for my support because the base is solid and easy to glue or drill through and I used an image transfer technique to create the background using a page from the Destinations Paper Stash. I thought the altered Salvaged Doll could be an artist, the faucet knob represents effort, the number stands for time, the key unlocks the idea, the gear stands for the process and the result is beauty represented by the three Heirloom Roses. Just don’t come anywhere near it with a magnet! 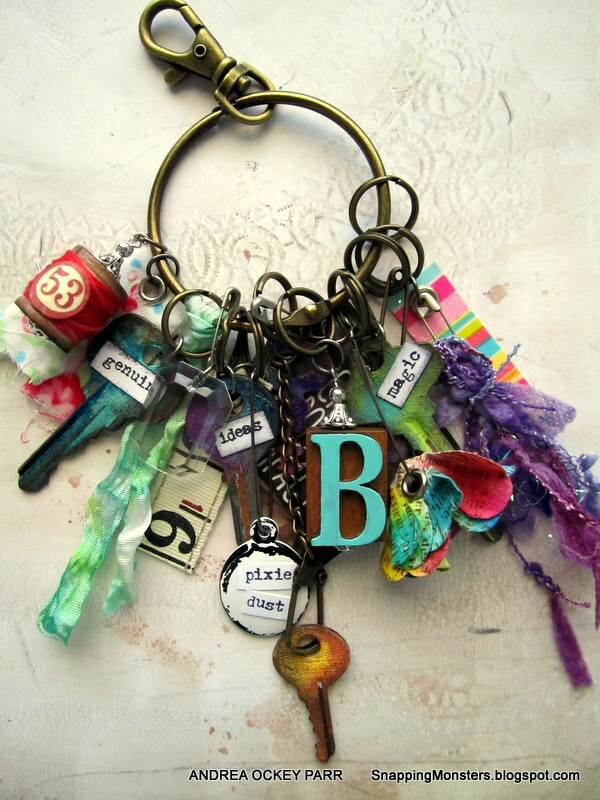 Andrea combined all sorts of metal bits and bobs to make this artsy key ring. This challenge theme inspired me to have fun with some keys that I sanded, covered with Gesso and colored with Dina Wakley acrylic paint. And since keys need a home, I went for the whole ball of wax with an artsy key ring. I used a ton of Tim Holtz goodies (letterpress letter, Little Words stamp, enameled tags, trinket pins, etc.) to bring my key ring to life. Anna-Karin added to her collection of metallic tags this week. I had some left-over Tim Holtz remnant rubs on my desk and started to apply them to a tag covered with torn metallic tape. After a bit of sanding and inking with alcohol inks, I thought the background was pretty cool and almost didn’t want to cover it up. The label, car and words were stamped with Tim’s Distress Archival Ink Palette and I also added a bunch of metallic idea-ology pieces. Barbara was inspired by steampunk and springtime! I love metal and I love Steampunk style! 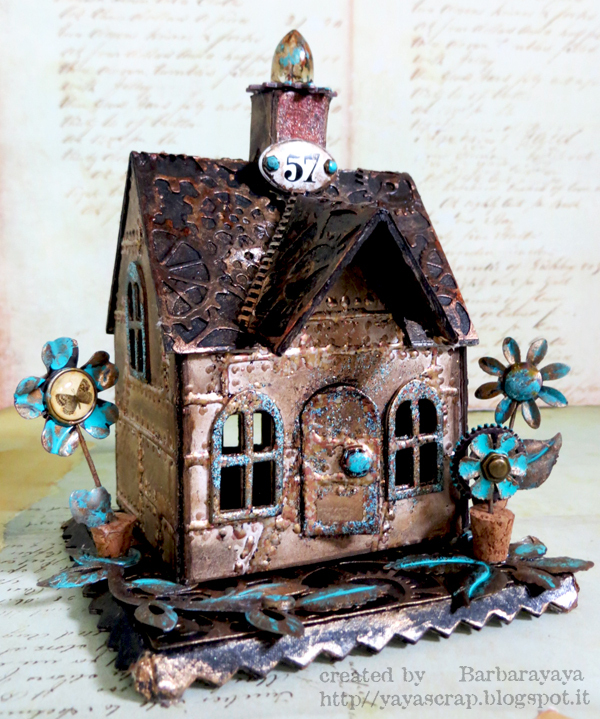 For this reason I couldn’t resist to use the new Tim Holtz Sizzix Gearhead Thinlits Die with which I decorated the roof of my little house that I cut with Tim Holtz Sizzix Die Village Dwelling! In my springly garden I used different elements Idea-ology and Prima Marketing altered with Distress Paints and Prima Flowers Metallique Paint Steampunk Copper! 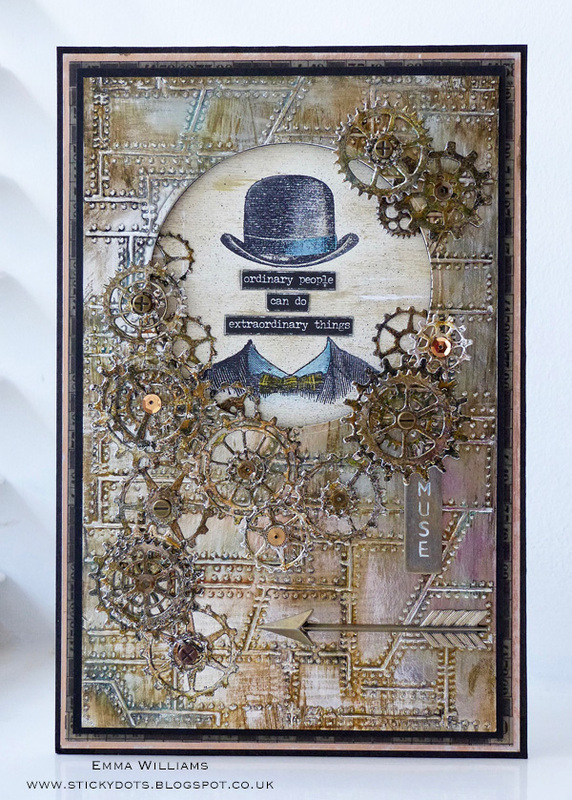 Cathie went outside her comfort zone and created a steampunk themed canvas. I created my steampunk bird from Tim Holtz Idea-ology Regal, Timepieces Clock Face and Clock Keys metal pieces. The vibrant colors on my base canvas are Dylusions Paints applied using one of my favorite techniques of applying paint with a Ranger Brayer. 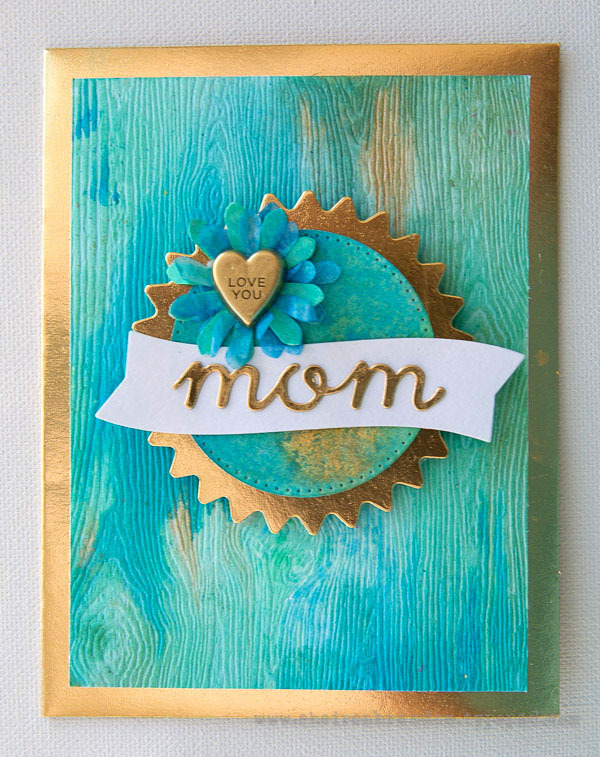 Cheiron used metallic paper and a faux metal embellishment on her card. I created my card base and most of the die cut pieces from Reverse Confetti Cuts flowers for Mom dies and Tim Holtz Kraft Core Metallic Paper. I made some coordinating Distress Woodgrain Cardstock with Distress Spray stains in Cracked Pistachio, Salty Ocean and Tarnished Brass. I also used the stains and some tissue wrap to create my flower. I substituted the traditional flower center with one of the Hello Love Resin Embellishments to finish off my card. Emma couldn’t resist the temptation of using metal as the main feature of her card! Just as I started working on this week’s challenge, the Tim Holtz Gearhead Thinlits Dies had just arrived on my desk and since metal and gears are a match made in heaven, how could I resist the temptation!?! So, I created a project, using metal foil tape to create a background, embossed with the Riveted Metal Texture Fade before being coloured with Tarnished Brass and Black Soot Distress Paints to create a rusty effect. After an addition of Distress Crayon, I created a circular frame for my Imaginary stamped image and surrounded it with die cut gears and metal embellishments! My card is full of hearts and colors. The hearts are cut from a watercolor paper. The base is Prima Salvage District paper stamped with circles and covered with a heavy acetate just to moderate the black circles. It seems my fave color combo contains purple + turquoise distress colors. I’ve mixed it with some Hickory Smoke to outline the edges and inside of the hearts, then I add some White Pen touches to the hearts. I stamped slightly a lace and stitch with the same grey distress. Glued all the composition with the 3D dots and put the metal sentiment inside the heart. Finally I drag the twine between two hearts and made a bow. The last thing was cutting the Love word and hang it up the twine. 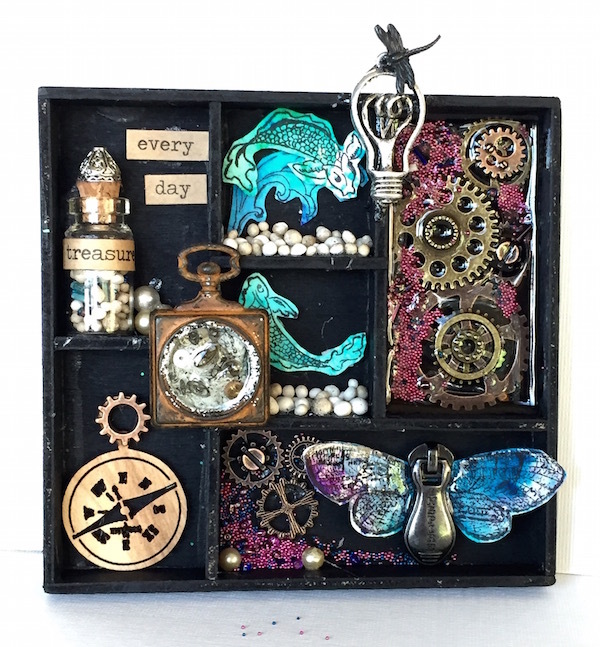 A rusty pocket watch inspired Maura to create a steampunk style shadow box. I loved that I got to try out some new products this week. 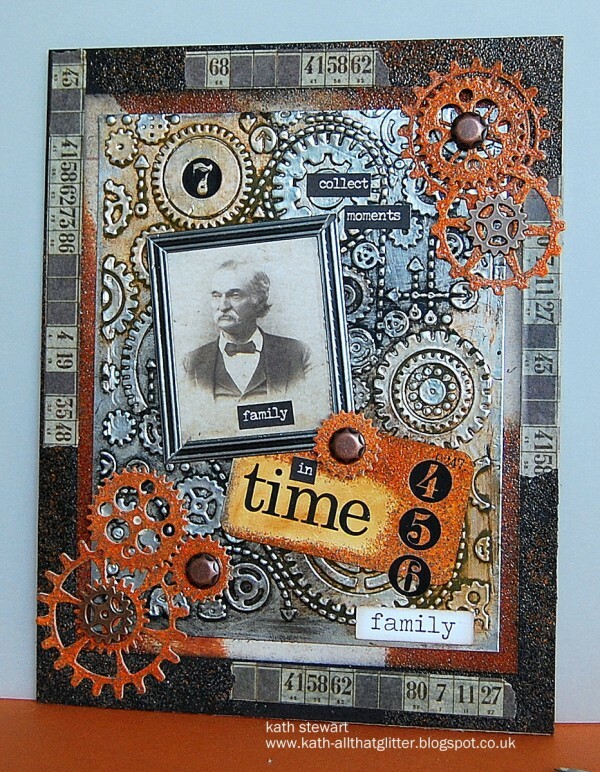 It all started with the wonderfully rusty Finnabair Mechanicals Pocket Watchers by Prima. I knew I wanted to try out the Ice Resin and Ivory Relique Iced Enamel with the watch and fill it with old watch parts. It is amazing stuff ! Then, Prima’s Stamp-N-Add Moth Wings arrived in the mail, and I just had to add it to the shadowbox of every day treasures. Meihsia is planning her family summer trip already. 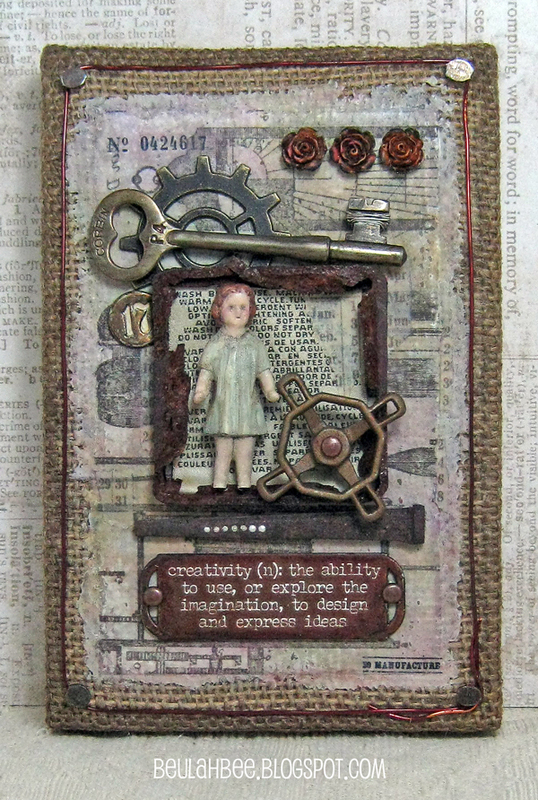 I was inspired to create this mixed media tag with some metal elements and the travel theme. 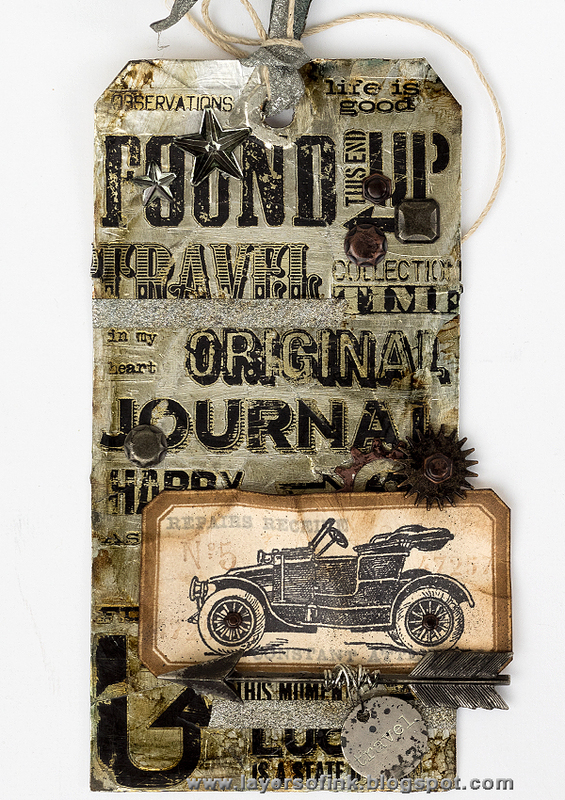 The background of this tag was embossed with Tim Holtz Texture Fades Embossing Folder and colored with Distress ink pads. After covering the tag with Faber-Castell Glitter Gel, I attached the metal embellishments as the final touch. I’m in love with the new Halftone & Rings stamp set from Tim Holtz! When picked it up from the post office the other day, it was inked up within minutes! I painted some Opal Magic Alchemist Paint over it to bring in the metallic shimmer, and the black ink became gold metallic. It really is magical paint! To add more metallic, I used a glue stick with Prima Rub On Foil. 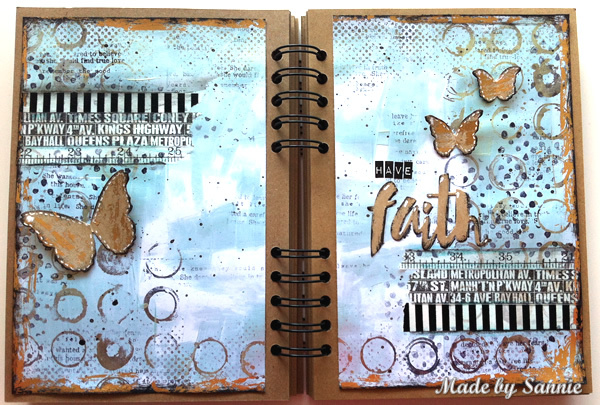 I used the new Painted Faith die from Simon Says Stamp from the My Favorite release! But also the new Butterfly Ensemble dies from Memory Box. 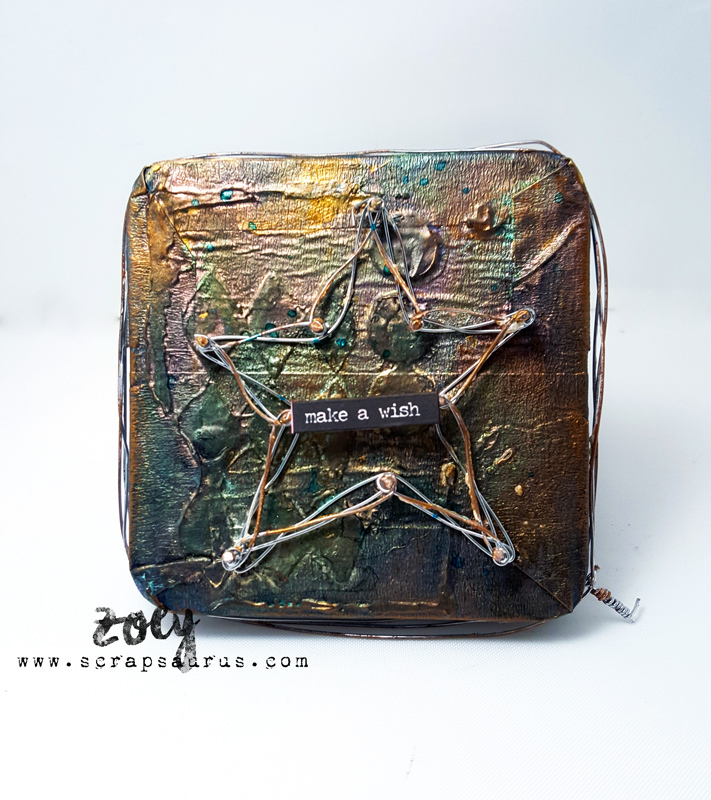 I love working with metal colors, and it is so easy when you work with Art Alchemy by Prima Marketing!. 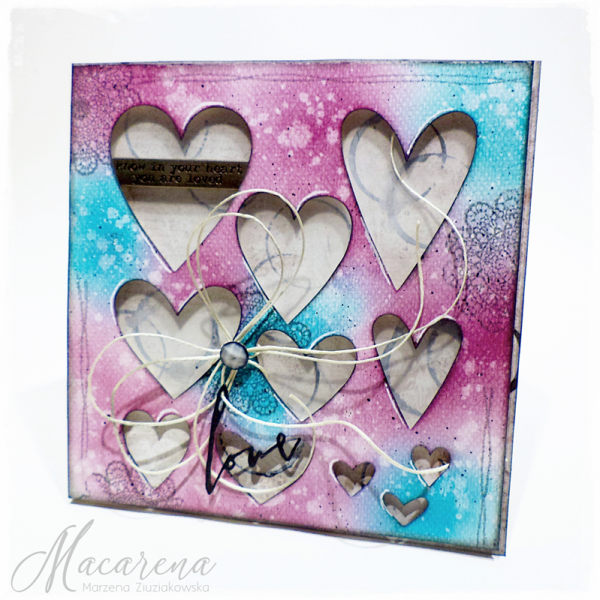 I also used The Crafter’s Workshop Mini Harlequin Stencil to add some transparent Heavy Body gel. As always Tim Holtz small talks are the perfect add on to the whole project! Fantastic inspiration! This is going to be FUN!!! Very cool creations this week. The DT Rocks with their Metal work! TFS and thanks for the challenge! I love this challenge Looking forward to creating something for it. Great DT inspiration. Wow!! Great inspirations and stunning works by the DT!! Thanks for sharing and for this cool challenge! Love adding all types of texture, including all the great metal embellishments available and just old “junk”! 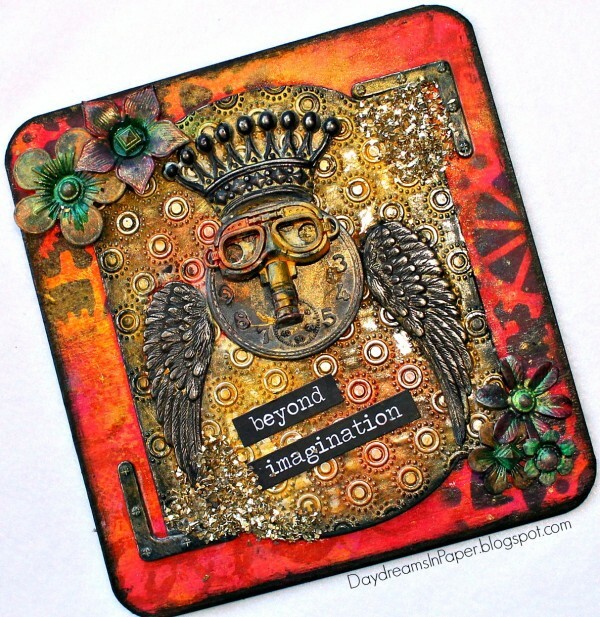 Wonderful Metal DT creations that do Tim Holtz proud. Have a BEE-utiful day! Totally knock-’em-dead creations by the team…..so awesome!!! Thank you for a great challenge theme!!! Absolutely wonderful inspiration by your design team. Awesome work by the team! Metal embellishments can add so much drama to any project. Thanks for sharing such wonderful inspirational projects. Blessings! wow!! Great Design team’s works!! Another girls made their perfect works too.. Sorry, I am never talented in this metalic theme.. So, I am a beholder only..